This basic recipe works equally well for apples, pears, or dried fruit. Fruit that has been poached in spiced liquid makes a delicious dessert. Poached dried fruit is also good for breakfast or brunch. 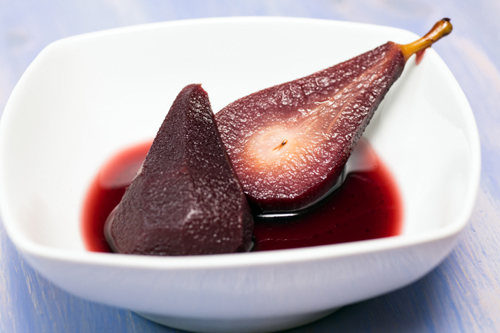 Pears in red wine sauce is just one of the many options you have for this recipe. In a medium-size saucepan over medium heat, combine the wine, water, sugar, honey, ginger, cinnamon, cloves, nutmeg, and lemon zest. Bring the liquid to a boil. Add the fruit and cook, turning the fruit occasionally until it’s tender and easily pierced with a paring knife. This will take 20 to 40 minutes for fresh fruit, depending on the size and ripeness, or 35 minutes for dried fruit. Remove the pan from the stove. Transfer the fruit to a bowl. Return the pan to the stove over medium-high heat and cook the liquid until it’s reduced by one-third, about 10 to 15 minutes. Remove the whole spices if you wish. Cool the liquid slightly and pour it over the fruit. Serve warm or chilled. Poached fresh fruit will keep in its liquid in a covered container for up to 3 days; poached dried fruit keeps for 3 to 4 weeks. Both should be refrigerated. Per serving: Calories 176 (From Fat 4); Fat 0g (Saturated 0g); Cholesterol 0mg; Sodium 1mg; Carbohydrate 46g (Dietary Fiber 2g); Protein 0g.